The current president of the NM Section of ASCE is Peter Martin. Peter T. Martin earned his bachelor degree in Civil Engineering from the University of Wales and practiced for ten years working in both Government and Consulting. He earned his Masters in Transportation, part time. He enrolled in the University of Nottingham, in England, where he earned his PhD in Transportation Simulation. He immigrated to the US in 1993. After a short spell in California he joined the faculty of the University of Utah where he built the Utah Traffic Lab, which delivered more than 50 applied research projects for UDOT and another 80 for other State and Federal agencies. The lab developed an international reputation for Advanced Traffic Adaptive Signal Systems Research. He has graduated over 60 Masters and doctoral students who have co-authored more than 140 peer reviewed journal papers and conference publications. From 2012 to 2015 he was Head of Department of Civil Engineering at NMSU. Today he serves a professor of Civil Engineering specializing in Transportation. 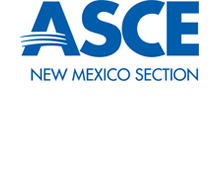 The New Mexico Section of the American Society of Civil Engineers (ASCE) represents over 800 ASCE members throughout New Mexico. It is composed of two branches, the Northern Branch (based out of Albuquerque) and the Southern Branch (based out of Las Cruces). Our goal is to promote the Civil Engineering profession in New Mexico and offer learning opportunities to our members. To this end, the Section hosts two engineering conferences every year, in the Spring and in the Fall. The branches offer monthly meetings with technical speakers that are of interest to Civil Engineers. We are also committed to supporting the Civil Engineering programs at New Mexico State University, the University of New Mexico, and New Mexico Tech. Scholarships are awarded at the Spring and Fall conferences for outstanding students of all three school at the Junior and Senior level. Additionally, the Section supports the student competition teams as they compete at the regional and national level. It should be an exciting year for Civil Engineering in New Mexico. If you are a member, please join us at one of our upcoming meetings. We’d love to see you there! If you are not yet a member, please visit the national ASCE website and sign up. Current members can also update their contact information via the national website. I look forward to meeting you and working together with you in the upcoming year. Peter T. Martin, PhD, P.E.